There are certain things we don’t talk about, and one such confidence brought 17-year-old Sara to the love of her life. But, will he be able to save her from the secrets, or will she drag him down with her? "Ethan Harris was the boy I hadn't been able to stop staring at since he moved in next door, the boy that every girl with eyes had swooned over at school for the past two years. The boy that had zeroed in on me from day one and refused to set his sights anywhere else. He must have asked me out a dozen different times, and every time I’d turned him down. The guy just wouldn't take no for an answer. I guess he wasn't used to hearing it very often." This short story was absolutely heart warming. 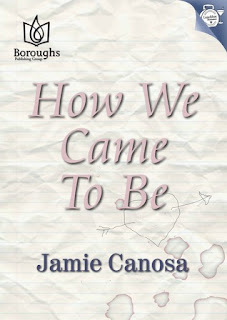 I would definitely recommend How We Came to Be as one of those really great short stories to read. I have had to write short stories before for classes and they are not easy at all to write since you have to fit a lot of information into a very small space, but I think Jamie did this very well. I loved how in such a small amount of time you completely loved Sara. She has endured so much hatred and violence from her dad, but she somehow kept her compassion and innocence. I think that really had something to do with the fact that she had to be there for her little brother, Kevin. I think if Kevin wasn't in the picture then Sara's heart would have turned to stone. Like I mentioned before the pacing was done very well and it didn't feel rushed. I felt like it was all done with good timing. The only part that felt fast was Sara and Ethan's relationship. I really loved their relationship and the bond they formed, but it did feel a little rushed. Really great short story. I think the subject matter was very interesting and was done really well. It really make's the reader root for Sara to get through it all. I think it was wonderful how in a short amount of time you could really love Sara's character so much and I loved that she kept her innocence and compassion through everything. Except for the pace of Sara and Nathan's relationship, I think the pace of the story was done very well and never felt rushed.